I am planning to make this Ragu Bolognese. The recipe looks so good, and I am due for a fun freezer filling project. The thing is though, that I hate, hate, hate liver. On the other hand, I really don't want to miss out on anything. Part of what I hate about liver will be mitigated by pureeing, because the grainy texture really puts me off, but I also hate that chemically, metallic, toxic nastiness. Are there any Bolognese experts out there who can reassure me? I'm told that the liver really hangs out in the background, and can't be picked out as it's own flavor. I have no problem believing that of the fish sauce that comes later, but liver? Really? Is there any way I can get the effect of long simmering the livers in the sauce but adding them later (or at least maybe half of them later) so that I can add them to taste? Also, does soaking them in milk make them more mild? OMG this turned out great! I ended up using half of the liver called for in the recipe, otherwise I followed it to the letter. There is a richness to the sauce that I don't think it would have had if I had skipped the liver entirely, but I can't taste it. For a bit of extra protection from toxic nastiness, I did carefully clean the liver and I soaked it for two hours in milk. The pasta is imported Italian Campanelle. Fair warning, a 5 quart Dutch Oven is not quite big enough. 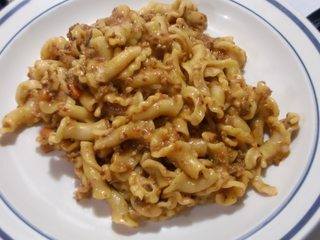 If the liver scares you, please take a look at this Ragù Bolognese recipe. This is the "original" (registered on 17 oct 1982 by italian kitchen academy) recipe and does not involve liver. Not the answer you're looking for? Browse other questions tagged italian-cuisine liver or ask your own question. What are some seasonings that can spice up a bland frozen chicken alfredo? How to make chicken liver less explosive?